I think you should be listen to your customers more! You took the Italian flavor out!!!!! I have been drinking that forever. It was a plus in my busy days. What's up with all this froth you have added...??????? Disappointed in your company. 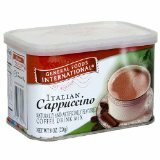 You can also sign up to be notified when General Foods International Italian Cappuccino Coffee Drink Mix is again in stock.